Saeed Jalili has never held elective office, yet he may have an important edge in the presidential race because of his close ties with Iran’s supreme leader. He is an insider’s insider. At the same time, Jalili is not a charismatic figure. He unsuccessfully ran for parliament in 2000 and 2004 to represent his hometown of Mashhad, according to his website. In a three-week presidential campaign, the challenge for Jalili may be winning sufficient public support in a field of better known candidates. Jalili has been secretary of the Supreme National Security Council since 2007. It is a powerful position, yet he has not had same visibility as his predecessors. His main strength has been his loyalty to the regime and commitment to the revolutionary narrative of Iranian independence from both East and West. His politics also fit well with the so-called principlist conservatives—or people who adhere to the revolution’s early ideals. Yet Jalili quickly went on a campaign offensive right after registering to run on May 11. He opened a Twitter feed, Google Plus account, blog and website—and in the first few days tweeted up to 50 campaign slogans in English, Arab and Farsi a day. He has had some uncharacteristically tough words for colleagues also running for the presidency. “Some politicians have certain view today, tomorrow they will present totally opposite views based on their own personal interests,” he tweeted on May 14. What support does Jalili have among the general population? Jalili’s wartime credentials may be one of his two major assets. Born in 1965, he belongs to a generation defined by the 1980-1988 war with Iraq. His official biography says he served in the Basij paramilitary under the Revolutionary Guards, whose influence in politics and the economy has soared over the past decade. Veterans won at least 16 percent of parliament’s 290 seats in 2004. 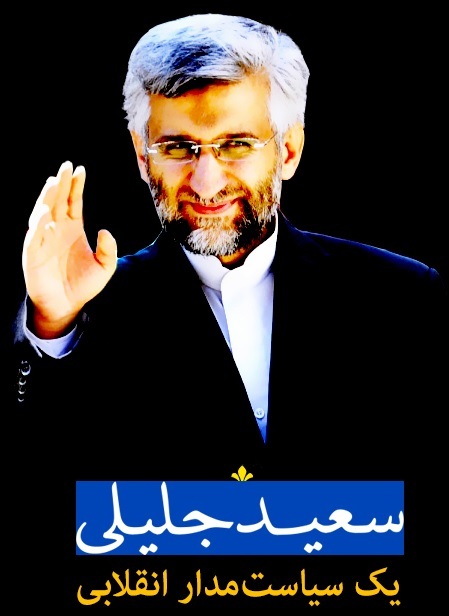 Jalili posted a picture of himself from the war on his campaign site. On May 13, he tweeted an article about a veteran’s association endorsing his campaign. Jalili has also served in highly visible government positions. He ran the supreme leader’s office from 2001 to 2005. In 2005, newly elected President Mahmoud Ahmadinejad appointed Jalili, a personal friend, to be deputy foreign minister for European and American affairs. In 2007, Ahmadinejad appointed him to be secretary of the Supreme National Security Council and chief nuclear negotiator. But Jalili has little experience working on domestic affairs, which may pose a problem since the economy is a key campaign issue. How is Jalili perceived among Iran’s political elite? Jalili and Ahmadinejad’s friendship has reportedly suffered since the president began challenging the supreme leader’s authority after his 2009 reelection. Jalili is now widely considered to be closer to the supreme leader, which could be a key to his political future. Many candidates are running on anti-Ahmadinejad platforms. Among Iran watchers, Jalili is also considered an old-time ideologue at a time when more practical issues, such as the economic crisis and international isolation, dominate the political space. Jalili has promoted his religiosity in his campaign materials. His campaign posted a picture of Jalili praying in a mosque in Kazakhstan during the April 2013 nuclear negotiations with the United States and five other world powers. What positions has Jalili taken on the top campaign issues? On the economy, Jalili has claimed that international sanctions against Iran have actually spurred economic growth. His campaign website has highlighted his drive to combat public corruption, which several candidates have blamed for causing the economic crisis. He reportedly dismissed 17 envoys while working at the foreign ministry for corruption. Jalili has also called for further privatization. Iran’s large public sector is widely regarded as inefficient. Jalili has taken a hardline position on the United States and the West. The United States “violates its claims about democracy and free trade by meddling in the internal affairs of other countries,” he said on a January 2013 visit to India. But in a May 14 tweet, his campaign supported U.S.-Iran cooperation to keep the Olympic committee from cutting wrestling. The Iranian team was scheduled to visit the Los Angeles and New York for two friendly matches to raise the sport’s profile that week. #Jalili's campaign supports world wrestlers from #US, #Russia, #Iran who unite to keep Wrestling in Olympics. Jalili has been a staunch defender of Iran’s nuclear energy program and right to enrich uranium. He has claimed that Tehran has no intention of building nuclear weapons. Jalili has also warned the international community against imposing further sanctions on Iran. He tweeted the following message on May 15, 2013. What role has he played in negotiations between Iran and the outside world? Since 2007, Jalili has been Iran’s chief negotiator in talks on Iran’s controversial nuclear program with the international community. He led Iran’s delegations in talks with both the world’s six major powers – the United States, Russia, China, Britain, France and Germany—as well as with the International Atomic Energy Agency, which is the U.N. nuclear watchdog. Foreign diplomats describe Jalili as adamant in defending Iran’s right to enrich uranium and long-winded, often taking hours to outline Iran’s positions. In negotiations, he is generally viewed as a purveyor of Iran’s position and a functionary rather than a pivotal decision-maker with the latitude to negotiate compromise on the spot. But they may be assets that generate trust within the regime’s inner circle. Jalili was born in 1965 in the northeastern city of Mashhad. He attended Imam Sadiq University after serving on the front during the 1980-1988 war with Iraq. The elite Tehran institution has prepared many students for bureaucratic positions. Jalili did his graduate work on political thought in the Koran. He reportedly published a book on the Prophet Mohamed’s foreign policy while working for the foreign ministry. Jalili has also taught courses on political science at Sharif University and Imam Sadiq University, according to the biography on his campaign website.